Delegates urged speakers from the new innovation centres set up to promote innovation in agriculture to maintain their focus on grassroots farming, at the beef workshop which kicked off the annual British Cattle Breeders Club Cattle Conference on Monday 23 January. Dr Mark Young of the Centre for Innovation in Livestock (CIEL) explained that the organisation had been set up to equip the livestock sector to move forward, by forging closer links between science and industry, with a focus on enterprise profitability. The role of CIEL is to enable collaborations between industry and research. Professor Mark Rutter of Harper Adams University outlined the goals of the Agri-Epi Centre, which was established to develop precision agriculture and innovation in agricultural engineering. It aimed to improve farm economic performance, by turning science into practice. The predicted growth in world population over the next decade was 10% in the developed world, with a figure of 20-30% for the undeveloped world, said Mr Rutter. This would present significant challenges to UK farming and among Agri-Epi’s current projects was the use of data collected by the Formula 1 motor racing team and the potential for expanding the utilisation of drones. Meanwhile, Agrimetrics spokesman, Professor Richard Tiffin, outlined the need to manage data within the industry. “Agrimetrics is the world’s first data centre of excellence for the agri-food industry,” he explained. “Some 95% of current data has been collected within the past two years and the volume continues to grow; it is vital that it is managed efficiently. Summing up delegates’ reaction to the workshop presentations, chairman Professor Mike Coffey said the world was changing “fundamentally and fast” and pointed to the need for the UK agricultural industry to respond and adapt to these changes. “There is a general willingness to engage with the centres for innovation, although there has been some surprise that they have been set up with relatively little consultation to industry,” said Professor Coffey, who is an SRUC researcher and a BCBC committee member. “If agriculture does not act quickly, there is a risk that our industry will be left behind. The Uber application is a prime example of how innovation can drive efficiency. It has changed the way that taxis do business within a period of just 18 months. “At SRUC, we are working with Agrimetrics to set up training courses for vets, to give them a better understanding of the application of genomics. Other projects involve establishing mobile meat sensory laboratory, to facilitate meat quality testing across all livestock species, as well as developing a mobile sheep feed intake facility, to improve sheep feed efficiency. 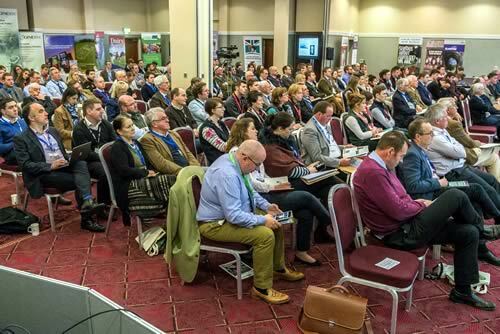 The British Cattle Breeders Conference ran from 23-25 January, under the theme ‘Practical Innovation – Today’s Challenges for Tomorrow’s Generation. Experts from around the globe gave insights into a variety of topics linked to cattle breeding, including the implications for cattle breeders post-Brexit.